Quirky and inspired architecture elevates this two-storey family home into a stylish residence that’s truly one-of-a-kind. While its design is certainly extraordinary, this featured house shows that you don’t need a sprawling acres-wide property or luxurious materials to make your dream home stand out. There are a lot of factors that go into the house’s overall look. From the doors and windows to the varying materials used throughout, every detail is important in building a beautiful and cohesive home. 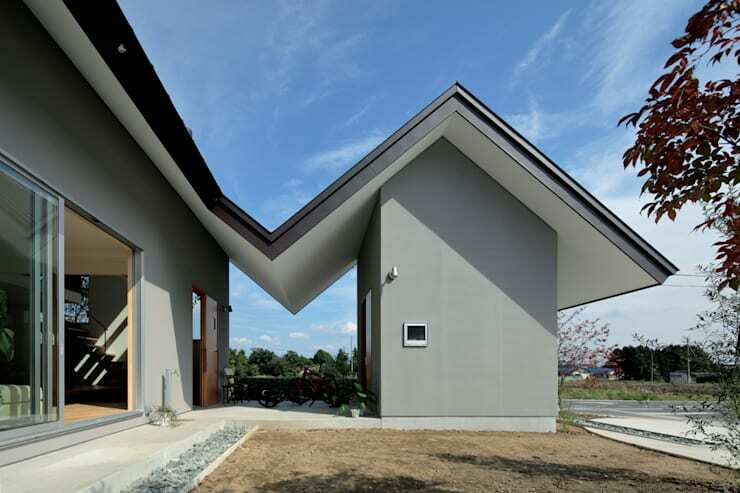 In this ideabook, we focus on the way Japanese architectural group arc-d tackled the roof of this featured residence to create an eye-catching façade. The unique shape is bold yet tastefully minimalist and clean, an outstanding example of modern originality. Even at first sight, this house is a standout. Its twin sloped roofs create a unique shape with an open area in between to serve much like a shaded porch. And while the design of the roof is very striking, the architect opted for muted colors throughout the façade to soften the look. Natural elements like the low stone wall and young trees help create an inviting atmosphere outdoors for residents and guests alike. The gabled roof, even from afar, is a dazzling façade, creating the picture of two separate structures connected by an open air area in the middle. These separate wings are not just a wonderful novelty aesthetically, but it is also quite practical, letting the residents enjoy greater privacy – even from each other. 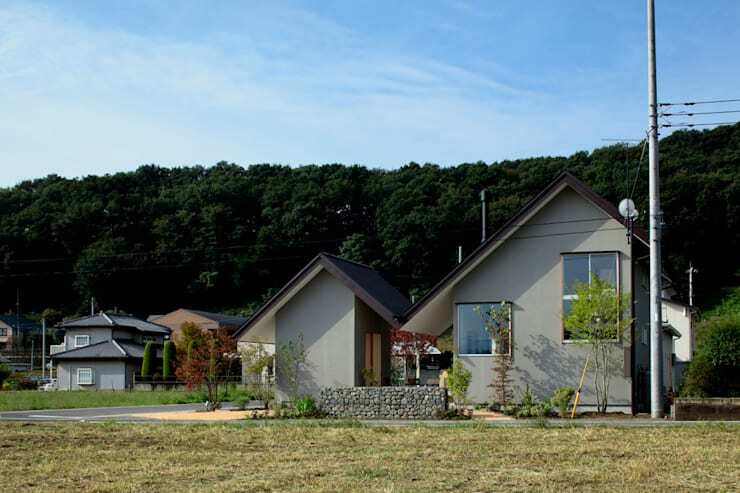 The smaller “house” can be used as a storage as seen in the featured home above. The one-of-a-kind roof design creates a beautiful shaded nook that looks like a unique take on the traditional porch. The indoor-outdoor living space allows the residents to enjoy the outdoors without fear for rain, sleet or other outdoor elements. Since the space is so well-protected, designers can feel free to place cushioned furnishings here for an ultra-comfy lounge area. Up close, the connecting area is small and cozy. It can be furnished with a couple of chairs and a table, but it can also be left nearly empty to foster easier movement through the two sections of the house. For kids and outdoor enthusiasts, this can also serve as a “parking area” for bicycles, skateboards and the like. Staying true to its modern inspirations, this home features a nice mix of artificial and natural materials. The wooden sliding doors adds to the easy, leisurely atmosphere of the house with the bright wood contrasting wonderfully with the neutral hues of the walls. 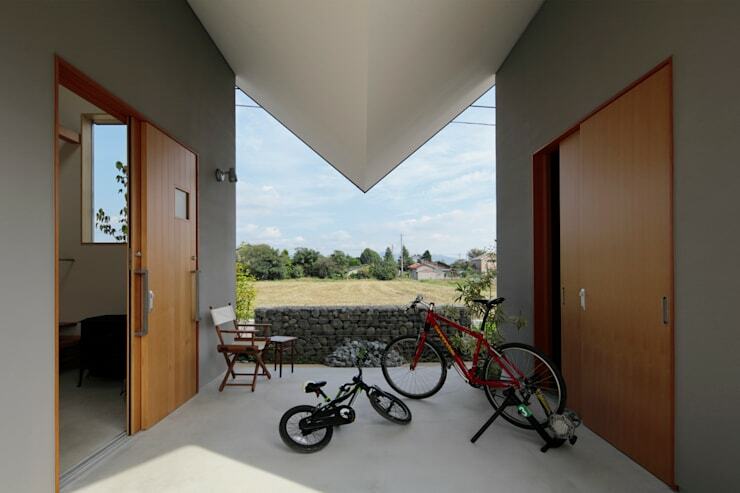 Notice the skylight over the entrance of the house – a great way to ensure the space is always flooded with light. Modern design favors clean lines and minimal décor – and this residence by arc-d delivers modernity combined with distinctly Japanese sensibilities. Elevated wooden flooring defines the one living area from the rest of the open layout room. 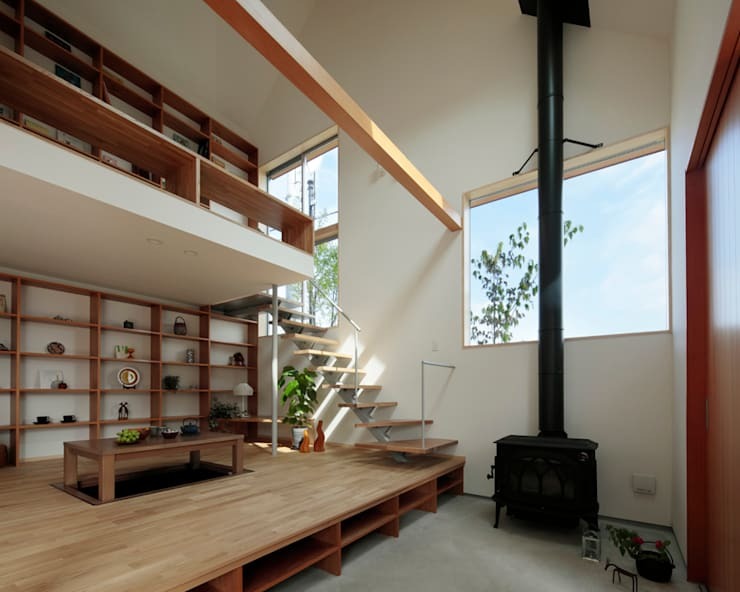 Floating staircase leads to a loft area that could be a small library or home office, a beautiful space that looks over the entire living area. With plenty of large glass windows, the interiors are bright and airy throughout the day. 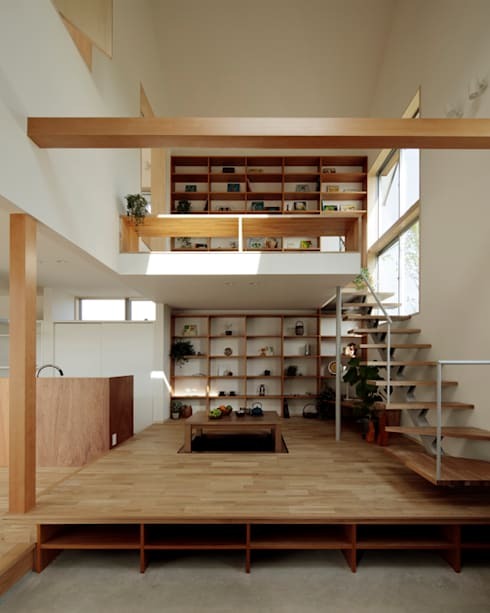 The architects got creative and used different levels of wooden flooring to divide the first storey into separate areas. 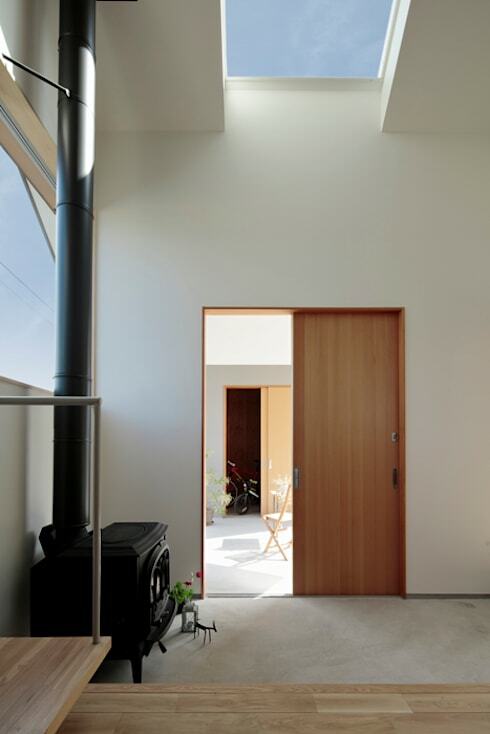 This lets the residents define the different “rooms” of the house without sacrificing the easy flow throughout. 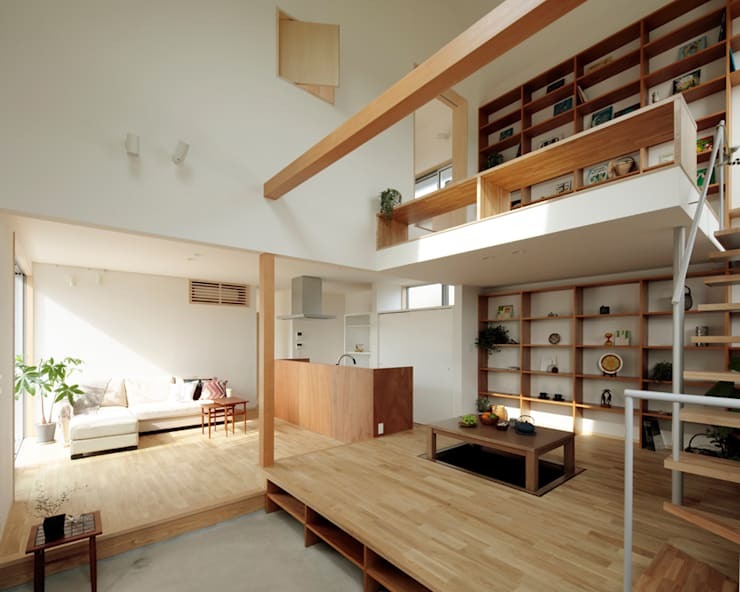 One side of the house is a dedicated living room and kitchen area. Both areas keep in harmony with the design aesthetic with wooden elements and neutral hues. One of the great highlights of the house is its warmth. Wood plays a big part in making the space incredibly inviting. From overhead beams to flooring, the wooden accents create a house that instantly feels like a home. Remember to add adequate storage for your things. The wooden shelves in the featured home are a good way to keep the house neat and uncluttered. It also gives residents the chance to display their most treasured mementos and photographs. 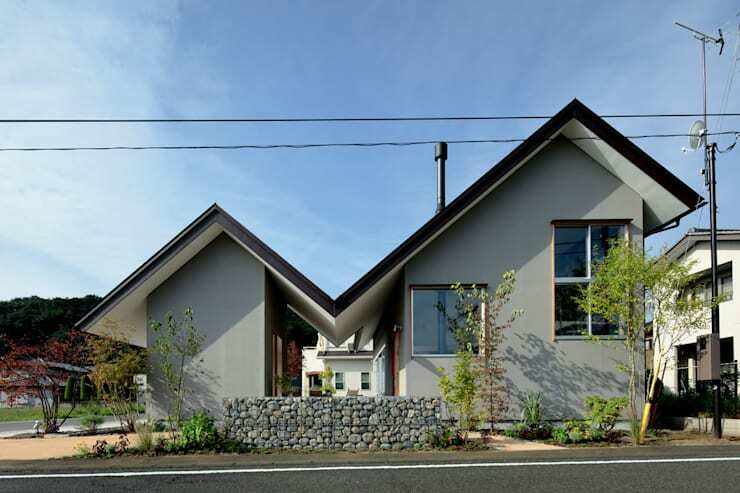 The overall composition of this house is remarkable. In particular, the main structure features plenty of mortar for optimum durability. 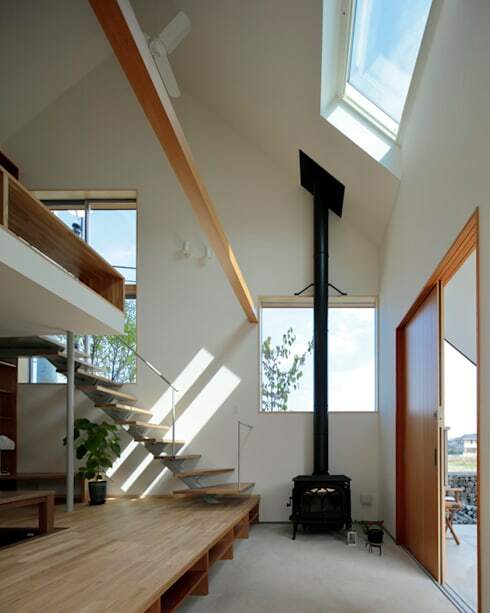 By combining it with wood that’s used throughout, the architects were able to make a home that is both warm and durable. For more on the different materials that can make your home stand out, check out these spectacular house facade ideas: what material is the right one for you?